The woman in the photo on a poster looks ordinary. Leaving a house and advancing towards the camera, she could be anyone’s neighbour — except for the fact that the image shows her heart as a target in the middle of a bulls-eye. The text, in dramatic red-on-black, blares: “We’re closing in”. The woman is being hunted. The text continues, “We’re closing in on benefit thieves with the help of hundreds of calls to our hotline”. This poster is part of a UK government advertising campaign urging people to report even their faintest suspicion that acquaintances might be receiving more welfare benefits than they should. Other photos in the same campaign show people holding a sign in front of their torso in the style of a police mug shot. The signs read, for example, “Benefit thief ”, or “Made to pay back the benefit I stole”. Launched by the Department for Work and Pensions in 2002 and amped up with dramatic graphic designs in 2009, the “Targeting Benefit Thieves” campaign offers rewards for tips — made anonymously — that lead to ending another person’s benefit payments. The campaign also included a website inviting anyone to customise its posters and press releases and to publicise its radio and television ads. The bulls-eye posters have been used on bus shelters, billboards, and phone kiosks throughout England, Scotland, and Wales. They have also inspired myriad tabloid headlines denouncing “Mansions for Scroungers”, condemning “Four Million Scrounging Families in Britain”, or describing an offer for “A Bounty to Trap Cheats”. Since the beginning of this campaign, ATD Fourth World’s members in the United Kingdom have felt hurt and angry by the highly publicised flood of negative messages and images accusing people in poverty of laziness and fraud. We wanted to respond together to this grossly misleading picture of benefit recipients. This led us to develop a project called The Roles We Play: Recognising the Contribution of People in Poverty. Published both in book form and as a multimedia website in 2014, the project also includes a short film and a travelling exhibition. Those conversations among our members resulted in the project “The Roles We Play”, evolving in 2009 with discussions and workshops that used positive imagery to challenge the widespread negative stereotypes about poverty. The project grew organically over several years. It yielded an exhibition of professional portrait photographs that toured the country in 2010 and a participatory film project in 2012. By 2014, we had expanded the photo exhibition to include autobiographical essays focused on what participants do to overcome poverty and the types of social exclusion they experience in their lives and throughout their communities. These activities range from working in a local charity shop to helping a terminally ill friend. To raise awareness of social discrimination against people living in poverty, we continue to run interactive community workshops focusing on the photo exhibition and book. In addition to this outreach, our members who created the book have been travelling around the country to run creative workshops at festivals and galleries and to take part in academic panel discussions. Using drama, poetry, and music, they focus on stimulating creative responses in disadvantaged communities to highlight contributions of people in poverty. “The Roles We Play” project combined two main themes. First, it encouraged participants to be aware of and value the ways in which they were active in their families and neighbourhoods. The project also built participants’ confidence to speak publicly about how they contribute to their communities. Beginning in 2011, a core group of key ATD members expanded the project to involve more of our long-term active members, young people involved in our European project, and other friends and supporters. They began by talking about how they see the roles they have played, both in ATD Fourth World’s work and in their neighbourhoods. Each person acknowledged the importance of other participants’ contributions to their communities. At the same time as they were preparing to speak publicly, many participants were also coping with various stressful issues their families faced, with help from ATD Fourth World. One workshop that focused on sharing skills and building confidence to speak publicly also examined the words, phrases, and slogans used in advertising, as well as those used to talk about ATD Fourth World: Why do we choose certain words? What impact do they have? One participant commented, “The language of politicians is lots of hot air, and desensitised. We should do it our way. What we did today — the use of role-playing — stops people from switching off. It’s a new language.” With these exercises fresh in mind, participants at the following workshop were videotaped by a local film-maker so they could get used to being filmed in different situations, from playing games and quizzes to speaking at a lectern on a subject of their choosing. During the next video workshop in 2012, participants spoke about poverty and dignity, and what those words meant to them. This work resulted in a four-minute film, Our Voices. 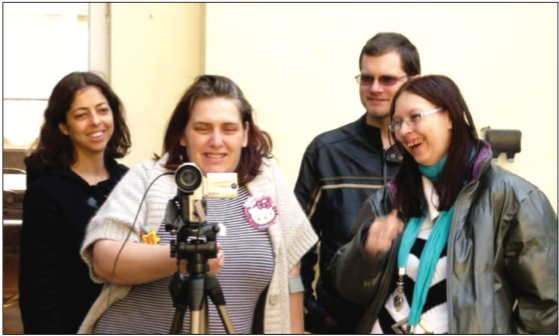 Later that same year, through weekly workshops, a small group of participants learned how to set up and use film equipment, record sounds and images, and create storyboards for scenes and narratives. They examined the varying impacts suggested by different camera angles. Eventually, they selected the stories and final footage for a ten-minute film: The Roles We Play. Groups facing prejudice know that being constantly stigmatised is damaging and disheartening. Humanity has made progress towards recognising the inalienable dignity of each person, regardless of gender, skin colour, and ethnic origin; yet because of prejudice and indifference, people in poverty continue to be regarded and treated as though they are worth less than others. Together, our members in the United Kingdom were able to stand up to the disparagement and banish “the illusion that we’re less than human”. Their courage in telling their stories helps people from all walks of life to rethink the way we treat one another. Trades Union Congress, “Support for benefit cuts dependent on ignorance, TUC-commissioned poll finds”, 2 January 2013. Alison Park et al (eds. ), British Social Attitudes: the 30th Report, London: NatCen Social Research, 2013. Stuart Connor, “We’re onto you: A critical examination of the Department for Work and Pensions’ ‘Targeting Benefit Fraud’ campaign”, May 2007, Critical Social Policy, volume 27. “Another ‘crackdown’ on benefit fraud, yet it accounts for just 0.7 per cent of welfare budget”, ThinkProgress, 16 September 2013. John Jewell, “Hatred, envy fear — it’s all in a day’s work for British tabloids”, 17 January 2014, The Conversation, United Kingdom edition. Daniel Newman, “How a Hollywood B-movie sent shivers down my spine over demonisation of the poor”, 8 January 2014, The Conversation, United Kingdom edition.